The third book in the gripping "Tiger's Curse" series! There's nothing better than returning to a familiar series. It's like slipping on a pair of your favorite jeans- comfortable and easy. It took me no time to fall back into stride with Kelsey and her two tigers. Even though it had been a while since I read the second book, I immediately remembered the story. Houck's detailed writing style and intense characters make this series difficult to forget. As always, the story centers around many of the myths and legends from ancient cultures. 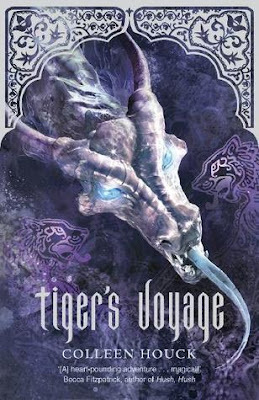 While the past two books focused mostly on Indian lore, Tiger's Voyage calls up on stories from cultures across the globe. Rarely do I find a work of fiction with so much educational value. Having said that, I rarely find books quite as fantastical as these, either. Each installment in the series is exponentially more magical and imaginative. Some of the scenes and adventures in this novel are astoundingly original. Houck never leaves out a detail or an explanation. Each meal is described in colorful language, down to the very last french fry or sauce. The rich writing makes it extremely simple to picture Kelsey and her fantastical world. The characters are equally as detailed. I couldn't help but love every member on the quest. My one tiny complaint about this series is the love triangle. Gah, sometimes I just wanted to yell at Kelsey. Her heart waivers between Kishan and Ren for far too long. I simply wanted her to make a decision. After a while, her worries and hesitations become tiresome. Other than that, I enjoyed Kelsey. She's intelligent, brave, and an overall admirable heroine. I'd definitely recommend Tiger's Voyage to any lovers of this series. It's an impressive sequel and will leave you dying to get your hands on the next book. Lovers of mythology and romance will devour this series.